Over the last six or seven years we’ve had someone living with us. There’s my family of four, and then this other guy, our tenant. We met him shortly after we got married and he needed a place to stay, and we had some extra space in our apartment, so we let him come live with us. It seemed like a good idea at the time. We assumed that he would come live with us a just a few months, maybe a year, and then leave… but he never left. We also thought he could really help us out. He was supposed to help with rent, help us maintain the place, help us in our personal errands and stuff, help us make friends in the area, etc. But actually it seems like the opposite happened. He made our daily life more expensive, he made daily life more complicated, he made our house more disorganized, and he even stole things from us. My wife and I have spent a lot of time talking about him, and our family, and just what we should do about all this. He’s caused a lot of problems that have affected our family, our marriage, even our health and relationships with others. I mean, it’s been several years and he’s still taking up space in our house! And so we’ve finally decided that he can’t live with us anymore. By the way, did I tell you his name yet? Oh, sorry. His name is Cray, but he goes by his first and middle name: Cray Z. Some of you may recognize his last name: Busy. Cray Z. Busy. Anyway, he’s been tagging along with me and my family for years now. And it all started shortly after we were married. I was a pastor of a small church in Indiana, and leading the church only required 25 or 30 hours of work each week. We thought we could use some extra income – we didn’t really need it, but the thought of having extra money sounded attractive – so I got a part time job. I later found out that Cray Z. had disguised himself as an extra income. Then that part time job became a full time job, and I pastored 20+ hours a week on the side. Anna also got a second job. Then I decided it would be cool to take some classes at a community college nearby, Ivy Tech in Indiana. And we had different ministry things and community things we became a part of… It just became a big mess of busyness. When we left Indiana to move to Dallas we thought we were done with Cray Z. Busy. We told him we were done with his shenanigans and told him and his bundle of stress to stay behind. Unfortunately, he snuck into our Uhaul while weren’t looking and we found him in Dallas. One thing led to another and busyness took over our lives again. Zero breathing room. We began to realize that not only had Cray Z. followed us here, but we were feeding him. And he was growing larger, taking up more space, and began to fill our calendar, checkbook, and life with things we didn’t want, activities we didn’t like, and people we didn’t care for. He's bought junk we don't need and left it all over the place. He’s marked on all the walls of our house. He’s ordered regular catalogs and mailings that we just don’t need. He’s opened all these accounts with every organization imaginable that we need to close out. He’s filled our calendar with all these things that we don’t even want on the calendar! So we’ve decided that we are going to start the process of having him leave. And it isn’t going to be easy. It will take a good month or two, probably even longer, to fully get him out of our lives. Now I know that some of you also know Cray Z. Busy. In fact, I talk to people all the time who use his name. I say “How was your week?” and they respond with “Crazy Busy.” I ask, “What do you have planned with weekend?” and they respond with “Oh, this weekend is going to be Crazy.” You know this guy I’m talking about, don’t you?! 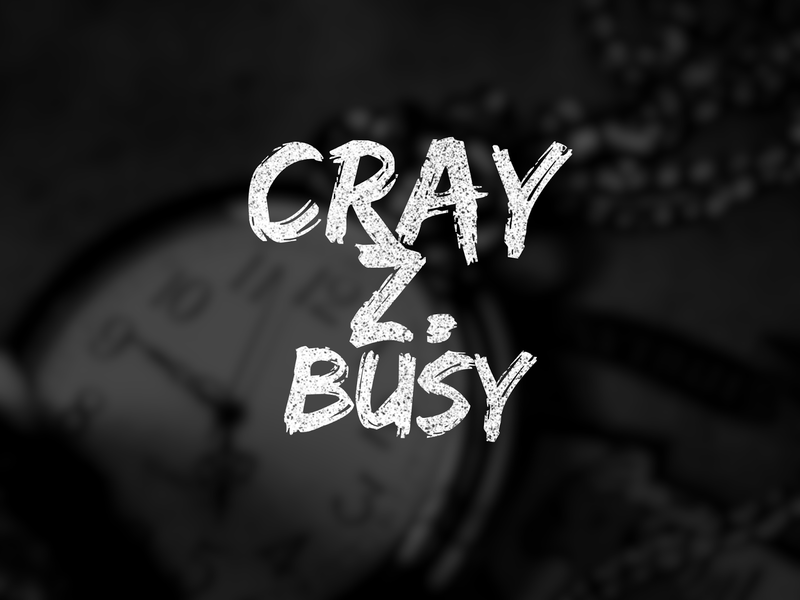 Believe it or not, Cray Z. has been around since Bible times. In fact, when God wrote the 10 commandments for His people, He devoted one of the commandments to helping us get rid of Cray Z. and to help us stop feeding him so much (the Sabbath). It’s time. Get rid of Cray Z.